Pre­loaded subwoofers make the life of a car audio junkie so much easier. We want big bass. And we’re American so we want it as easily as possible. Pre­loaded enclosures are ready to go, toss one in your trunk, the back seat, wherever. You don’t gotta spend two weeks waiting for your buddy to make you box in his free time or over paying an installer. Kicker updated their Dual CompR Subwoofer loaded enclosures this year and they are seriously impressive. 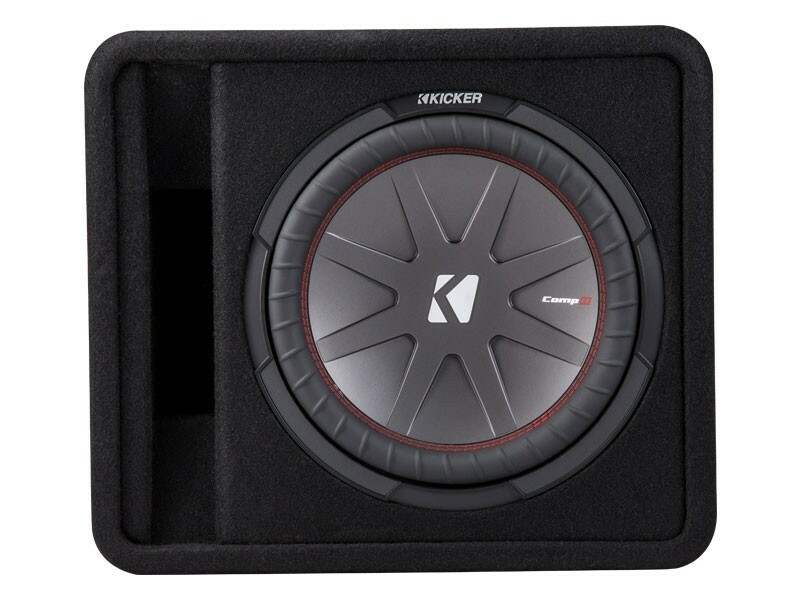 Kickers 2nd from the best subwoofer enclosures! 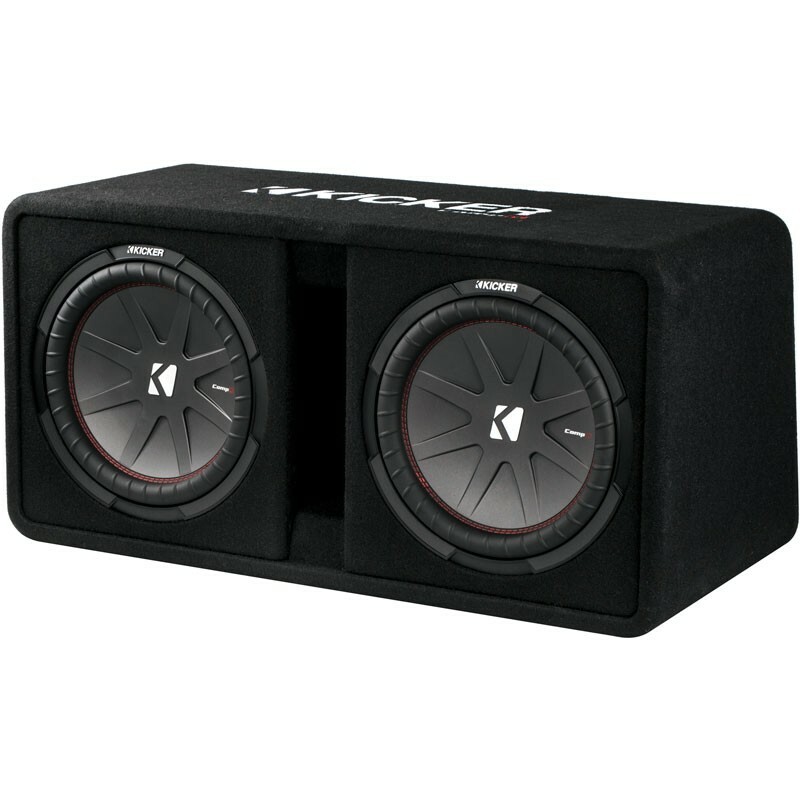 You can get a Dual CompR enclosure with 10″ subwoofers or 12″ subwoofers, or a single enclosure with one 12″ subwoofer. They’re extremely durable, take up a good amount of space and weigh about the same as a fat baby and a dead dog. (Measurement graphic) These beefy boxes are built for extreme bass with internal bracing, thick MDF construction and custom embroidery. But a box is only as good as the subwoofers inside. CompR Subwoofers get their boast worthy power handling from their stacked magnet structure. Kicker’s signature double stitching bonds their improved Solokon, which adds rigidity and accurate response, to the ribbed Santrpoene surround, which provides flexibility to eliminate distortion. These car subwoofers have a final impedance of 2ohm. The dual 10″ has a max power of 1,600 watts, the dual 12″ has a max power of 2,000 watts and the single 12″ has a max power of 1,000 watts. To provide improved thermal management Kicker designed the structure of the CompR with their UniPlate back plate and Ultra ridged cast aluminum basket.